The Jan. 6 report, citing unspecified international media sources, was published in Walla News, one of the largest online Israeli news agencies. Since 2015, the report said, the Israeli Air Force went far beyond targeting ISIS in Sinai, striking a "large number of weapons transfers from Sinai to the Gaza Strip for Hamas." "Hamas's military wing was interested in upgrading its arsenal of locally-produced rockets, which experience rapid erosion, and are not as high in quality as the standard [industrial-level] rockets," the report said. Despite the Israeli interdiction, "Hamas is still able to fire rockets at Tel Aviv and the surrounding area. Recent statements made by the outgoing Israel Defense Forces (IDF) Chief of Staff Gadi Eisenkot, who ended his four-year tenure on Tuesday, seem to confirm the report. 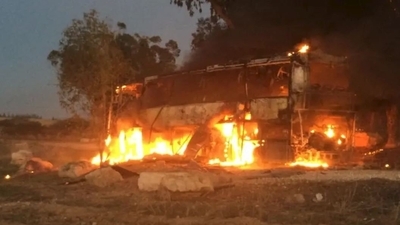 "We have foiled the smuggling of 15,000-20,000 rockets [into Gaza]," Eisenkot said during a visit to a region of southern Israel that has experienced frequent Hamas rocket attacks. Last February, ISIS in Sinai reportedly seized Iranian weapons en route to Gaza, including Kornet guided anti-tank missiles and GPS-guided arms. Hamas has used such weapons to fire on Israeli vehicles from Gaza. Such reports appear to indicate that Iranian efforts to push weapons into the hands of Gaza's terrorist factions have not ceased, even if they have been reduced due to Egypt. Egypt has taken a proactive role in destroying smuggling tunnels that link the Sinai Peninsula to the Gaza Strip since Abdel Fattah El-Sisi replaced the Muslim Brotherhood's Mohamed Morsi as president in 2014. This change forced both Hamas and PIJ into domestic arms manufacturing, with the backing of Iranian cash and know-how. The Israeli Air Force has struck many local rocket production facilities in Gaza, including medium-range projectiles that place greater Tel Aviv, Israel's financial hub and largest population center, in range. While Israel's Iron Dome air defense systems provide protection against the rocket attacks, recent skirmishes illustrate the fact that air defenses are not hermetic. In November, for example, Hamas fired more than 400 projectiles at southern Israeli civilians, killing one man and injuring several more. In addition to the risk of death, injury, and destruction they pose to Israeli civilians, the rockets also create psychological trauma, particularly to children living in southern Israeli areas that have been shelled on a regular basis. The recent report on Hamas's major smuggling activities in Sinai also served as a reminder of the Gazan terrorist regime's complex relationship with Sinai Province, the local ISIS affiliate. Cairo is in the midst of a massive military crackdown on the Salafi-jihadist terrorists in Sinai. Egypt also wants to influence Hamas in Gaza, despite the deep hostility that exists between the Gazan Islamist regime – a natural affiliate of the Egyptian Muslim Brotherhood –- and El Sisi's administration, which views the Brotherhood as a severe terrorist threat. Egypt is concerned Gaza serving as a weapons supply source and a safe refuge for Sinai's terrorists, which is why it has pressured Hamas to cut off all ties with ISIS. This cooperation also allowed Hamas to 'outsource' terrorist attacks against Israel to ISIS in Sinai, when it tried to prevent Israeli retaliation in its home turf in Gaza. That incident could reflect Hamas's moving away from ISIS in Sinai, in response to heavy Egyptian pressure. Hamas is dependent on Egypt's good will, due in part to the Egyptian-controlled Rafah crossing – the only gate Gaza has to the rest of the world. Egypt is the most important Arab power in the vicinity, and could choke off Hamas if it wishes. At the same time, Hamas has tried to fool Egypt in the past, pretending to move away from ISIS in Sinai, while continuing to cooperate with it. In November, the Middle East Media Research Institute (MEMRI) released a document that provided recent evidence of cooperation between Hamas's military wing and Sinai Province. The document, a religious opinion written by an eminent ISIS cleric who is part of the organization's bureaucracy, detailed types of assistance that Hamas provided to ISIS, including weapons transfers "both to and from Sinai, logistical support, financial support, supply of ammunition, and [the] transfer of wounded to Gaza." Due to the innate ideological hostility between Sinai Province and Hamas, the cleric objected to this cooperation, although "he did rule that receiving weapons from Hamas could be permitted under certain conditions," according to the report. Ultimately, it appears as if Hamas is not satisfied with its ability to mass produce its own weapons in Gaza and remains committed to importing high quality weapons from outside of Gaza to terrorize Israeli civilians, and target the Israeli military in future wars.